This will be my last blog for the month since I will be traveling so much. I am leaving today for Washington, DC until next week. Then it is TNNA in Columbus and after that the conference in Manchester. My next entry will be in July. I'll report on TNNA and the conference. I received a fair number of lessons for review and two of the students in my Swatch to Sweater class are ready to shape the armholes. I'm glad I heard from them before I left. Last week I discussed SSK and K2tog decreases. These are the most commonly used decreases in US patterns. If you look at British or Japanese patterns you will see they use SKP decreases much more often. The SKP decrease is the older decrease. I am not sure when the shift occurred in the US but you rarely see SKP decreases in books printed after the mid-1980s. You will see it in the new Harmony Guides but the editor is British. 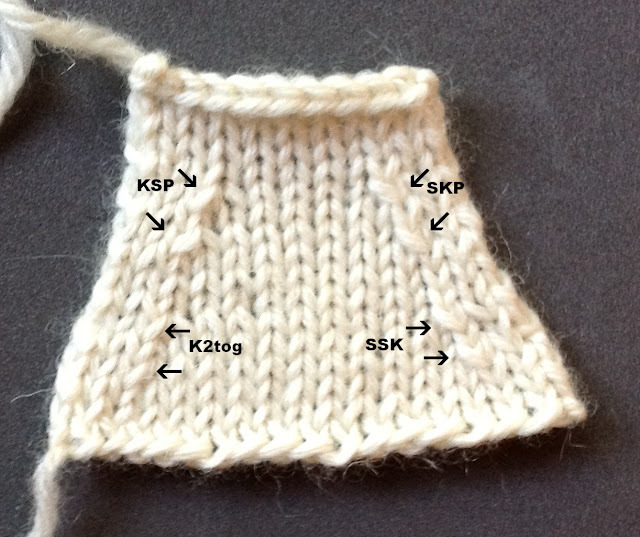 The reason the SSK replaced the SKP is that SKP decreases tend to be a bit larger since just one stitch is slipped. Also passing a stitch over another stitch always stretches it out a bit. When worked properly, the SSK is a much better match to a K2tog. That doesn't mean that you can't work an acceptable SKP, you just have to work at it. You just have to use your needle tips and to really try not to stretch it out. If you work on Level 1 of the Masters Program or do the Basics class you are asked to work a KSP decrease which you will probably NEVER see in a pattern. I know I never have. Why do we bother to include it? Well, we like to expose knitters to a wide variety of techniques and it is a good match to a sloppily worked SKP. It gives you a point of comparison. 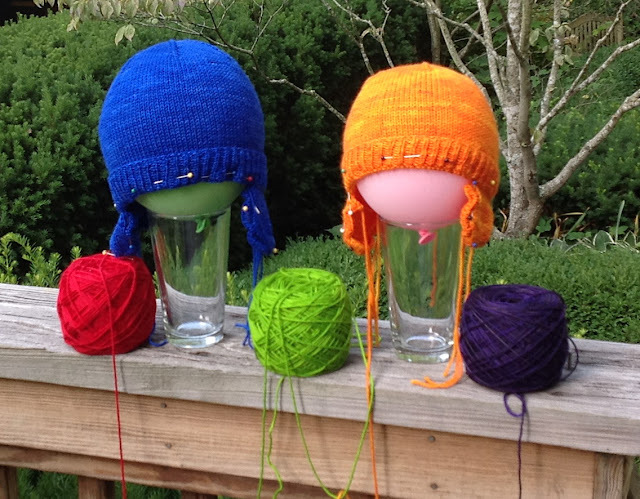 We also want to encourage knitters to look at their own work with a critical eye. It is the same details which make a garment look hand made rather than home made. The photo shows K2tog, SSK, SKP and Ksp decreases. You can see that the SKP and KSP decreases are a bit larger. Any time you slip a stitch or pass it over another stitch, it will get stretched out. Remember your friend the tapestry needle. You can tinker with the afterwards. I didn't tinker at all with the decreases above. During July, the tips will be about twisted decreases, purlside decreases and double decreases. I finished up my personal projects. Now I just have to remember to send them. 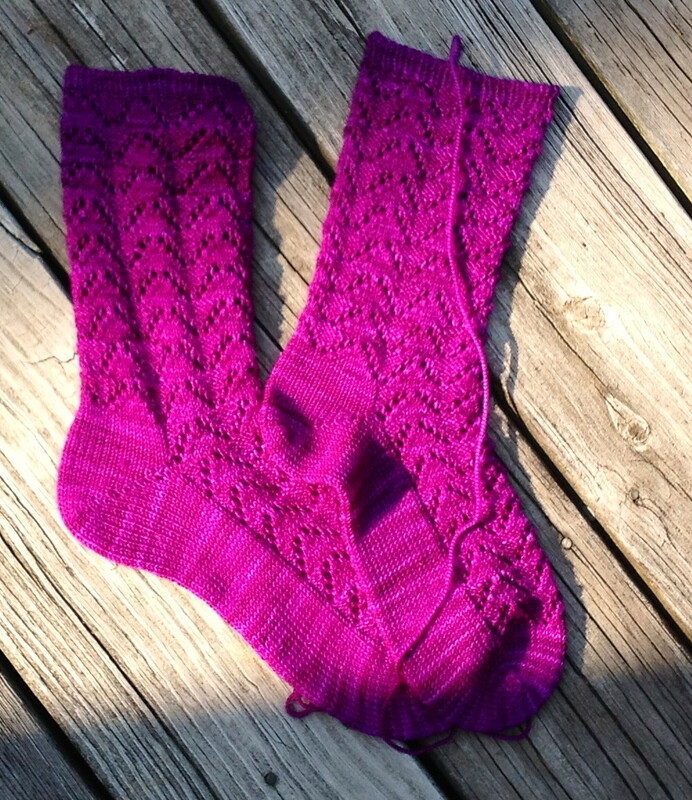 These socks sure are purple. Martha will love them. I had to work up a baby hat for some people we are visiting on our way to DC. They have their first granddaughter. For the pink and green I used some Millamia I had and I bought the white at Magpie. It is so soft and lovely to work with. I had the whole thing finished and noticed that I left out a row in the flowers so I took the whole thing out. Here's a something I should put on a needlepoint pillow. LOOK AT YOUR WORK EVER SO OFTEN. I really hate it when I do something so moronic. The first thing I am taking on for Cast On are the snowboarding hats. The yarn Baah! yarns). The colors are so bright and vibrant. After looking at the yarn we had picked out in the selection meeting I thought some yellow yarn would perk them up. The owner of the company is so accommodating. 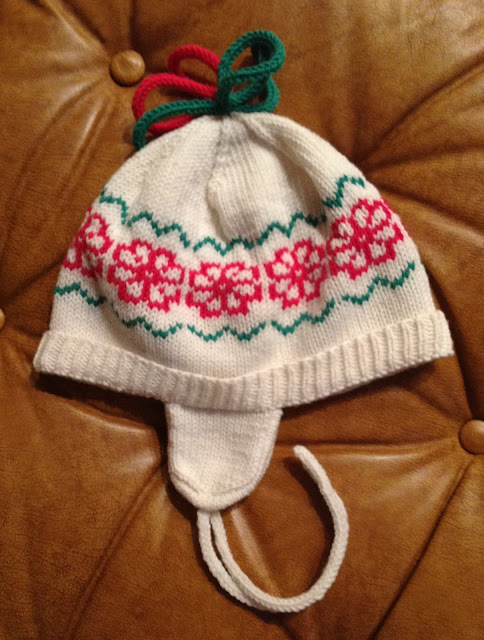 I'm contracted just to do a toddler, child, and young adult hat but I decided to throw in a baby hat as well. I've got enough yarn. Here are the hats I've finished so far. I won't do the dreads until they are all done. The child hat will be green and the young adult hat will be red. These should be lots of fun. I've never seen a KSP in a pattern ... but when I'm working in finicky yarn and am having a hard time working a k2tog, the KSP is a lovely back-up. The KSP is also a great way to work a missed k2tog in a previous row. I like that the skp and ksp are more visible, because I've been looking for ways to add more texture. I actually reversed the skp and came up with something similar to the ksp, and decided to check whether it already existed and what it might be called. 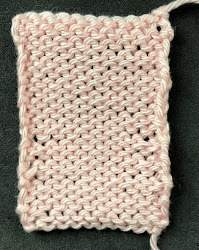 What my "accident:" does, is lift the loop on the left-hand needle up and back, so that the second loop then becomes first in line - that then gets knitted (or whatever else one might want to try ;) ) and then the stitches are manipulated to slip the original stitch over the knitted one. BUT the ksp has the same visual result and is much simpler to do! So, thank you for posting this, and for keeping it accessible!